Mood board: Though John Galliano showed his first Artisanal collection for Maison Margiela in London last week, it was mere chance that A/W’s menswear outing should lean towards the sensibilities of the British capital too. The house however confirmed he had no hand in the collection, which retained the eclectic and sartorial alley cat spirit of spring, with a heady dose of nostalgic colour thrown in (or on). Whilst a skew of full tailoring looks could have fallen from Patrick Bateman’s clinical wardrobe, artsy inflections began to creep across coats and gilets in jacquard stripes and smudgy marbling, with zingy Lurex knits and a tinsel bomber flashing with a perverted sense of psychedelia. 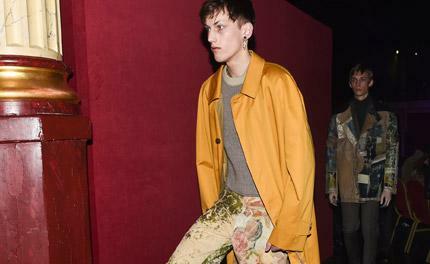 Best in show: It’s always a welcome distraction when Artisanal pieces find their way into the menswear show, amping up Margiela’s subverted ‘craft’ aspect. Here, they translated as a pair of shell-like waistcoats dripping and smeared like a painter’s palette, and a paler canvas coat whose oily blue and green colours extended down the model’s fingers. Finishing touches: Margiela menswear is rarely an accessories tour-de-force, however the team has always had a way with a weird shoe. This season a slim topstitched boot that contoured up the instep was rendered in a melee of textures and tones – from red lizard to a particularly fetching mismatched pair in a woven zigzag cloth.